Welcome clients at the airport and trasfer to hotel and check-in. A short briefing on the program after refreshment. Day 02: An exciting sightseeing tour in three beautiful queen cities in Kathmandu Valley meanwhile our liaison officer will process and obtain travel permits for India . Day 03: Fly out enroute to Bhadrapur airstrip after landing a drive towards the town of Darjeeling a famous nick name earned as the queen of the hills. Almost Something like of 6 hours driving from Bhadrapur ends at Darjeeling and overnight stay at hotel. Weather permitting, we will rise early and drive to Tiger Hill to see the sunrise and views of Everest and Kanchenjunga . If the weather is inclement, we will try again next morning. 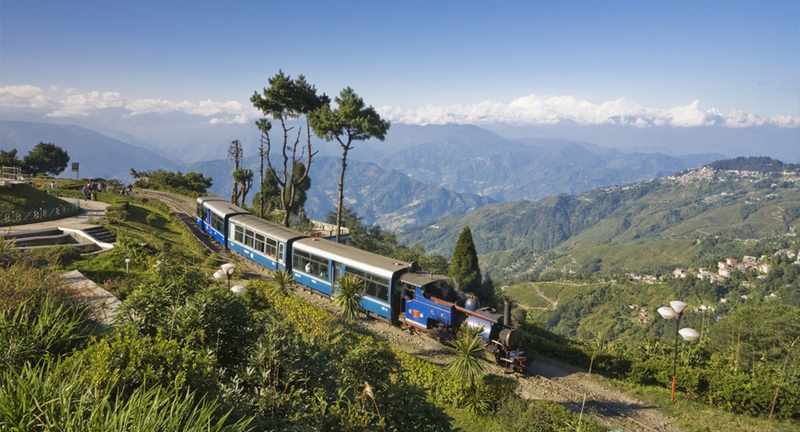 Upon returning from Tiger Hill we will have breakfast, then have a full day of guided sightseeing of Darjeeling , visiting monasteries, schools, tea gardens and landmarks such as the Himalayan Mountaineering Institute. Late afternoon tea and trek briefing at the Tenzing Norgay family Residence. We will have the unique opportunity to visit the late Tenzing's personal museum, which houses an invaluable collection of medals and personal memorabilia. After breakfast, we will drive via Ghoom approximately two hours to Teesta River. On the way to Teesta we will stop at "Lovers meet", the confluence of the Teesta and Rangeet Rivers . After breakfast we will spend the entire day sightseeing in Gangtok. First we will visit the Tashi View Point for a panoramic view of the entire Kanchenjunga range. Full day of guided sightseeing; visiting important Sikkimese cultural and religious landmarks. Pemayangtse, the old capital of Sikkim , is home to one of the most beautiful and sacred Buddhist monastery in Sikkim . From Pemayangtse, we will witness a magnificent panoramic view of the Kanchenjunga range. Driving time from Gangtok to Pemayangtse is about five hours. En route we will travel over the Rabong La pass. Break for picnic lunch along the hillside overlooking the village of Legship and Tashiding. Overnight at the Norbu Ghang Resort. (A newly opened Sikkimes style resort). We will wake early morning to see the sunrise on Kanchenjunga . After breakfast we will visit the sacred Pemayangtse monastery. Pemayangtse, which means "the Sublime Perfect Lotus" signifying purity, is regarded as one of Sikkim 's most sacred and prestigious centers of religious learning. After visiting Pemayangtse Monastery, we get into our vehicles and drive through cardamom groves and small Sikkimese villages to Yoksum, which is about two hours away. At Yoksum we will meet our trekking staff; the Sherpas, cooks, porters and yaks. Yoksum is one of the most historic sites in Sikkim , as it was here in 1642 that three monks got together and crowned the first Chogyal (King) of Sikkim . On arrival, we will do an introductory hike (45 min) to Dubdek monastery, which is beautifully situated overlooking the village of Yoksum . Overnight in camp. Rise early morning with a cup of hot bed tea. After breakfast we begin our voyage into the pristine Sikkimese wilderness. Today's hike will be about six hours, the trail passes through rich wooded hills of oaks, spruce, orchids, giant magnolias and rhododendrons. We will break for lunch along our route, then continue walking up the Ratong Valley . After crossing the Prek Chu, we have a steep climb to our camp by the village of Bakhim . Overnight in forest bungalow. After breakfast, we begin a moderate climb through yak and sheep grazing areas of Choka, a resettlement camp for Tibetan refugees and the last village encountered on the trek. affter Choka, the trail continues "uphill" through rhododendron forests until our camp in Dzongri. We will see our first closeup view of Mount Pandim along today's trek and, upon arrival in Dzongri, witness awe-inspiring views of Kanchenjunga and all its satellite peaks. Overnight in Camp. Back up day for sunrise on Kanchenjunga . Day hike to Gingay Dara, which is a pass looking into the Ratong Valley with panoramic views Ratong Glacier, Koktang, Kabru, Frey and peaks to the south of Kanchenjunga. This area is designated for high altitude mountain training for students undergoing basic and advanced courses with the Himalayan Mountaineering Institute. The hike to Gingay Dara is moderate, about four hours round trip. We will rise at dawn (weather permitting) and hike to the "hill top" for sunrise upon the Kanchenjunga range and the Onglathang Valley. Return to camp for breakfast then march on to Thangshing. We will see beautiful views of Kabru, Sinolchu, Simvu, Pandim and Goecha Peaks along the trek. A steep downhill will bring us to our lunch site, which will be by the river. After lunch it's a gradual uphill along the Onglathang valley, through meadows and gorges to camp in Thangshing. We begin our approach towards our last camp at Samiti, hiking uphill through the Onglathang valley, past yak herders and grazing yaks. After traversing through rocky terrain we reach our high wilderness camp at Samiti. Our camp will be by the sacred Lake Samiti , perched under Mt. Pandim (21,952ft). We rise early for a day hike to our final destination, Goecha La. The trek to Goecha La and back is about five hours and can be strenuous, depending on the weather. Also the terrain is more challenging than the previous days on trek.. For those who are unable to go to Goecha La and would prefer an "easy" day, we have the option of hiking to a viewpoint about one hour en route to Goecha La. The viewpoint provides great views of Kanchenjunga and surrounding peaks. For members continuing to Goecha La, the hike is strenuous. Upon returning to camp we will continue to Thangshing, which is downhill all the way. We leave the Onglathang Valley behind us as we descend down to Kokchurong, about one hour from Thangsing and Trek back to Bakhim along a different route. This route is a little longer, off the beaten path and goes along the edge of the hill for about 3 hrs. We join our previous trail at Phedang where we will have lunch. Then we walk about 2hours to the village of Choka . At Choka we will visit the local monastery then continue to camp at Bakhim. Hike along the same route to Yoksum. It's an easy day of trek; we reach camp by early afternoon. The rest of the afternoon is free to explore the town of Yoksum . This will be our last evening with the trekking staff. We will have a fun filled cultural evening filled with traditional singing and dancing. Overnight at Hotel. After breakfast, we say our "good-byes" to the trekking staff and board our waiting vehicles and drive to Darjeeling . We continue our journey along the Rangeet and Teesta rivers as we ascend to Darjeeling , arriving by late afternoon. Upon arrival, a hot shower awaits us, as we change into fresh clothes and get ready for farewell dinner. After breakfast, do our final packing, before departing for Bhadrapur via Kakarvitta to catch our flight to Kathmandu . Day 20: Arrival in Kathmandu free day and in the evening a farewell dinner. Day 21: Transfer to the airport for departure.